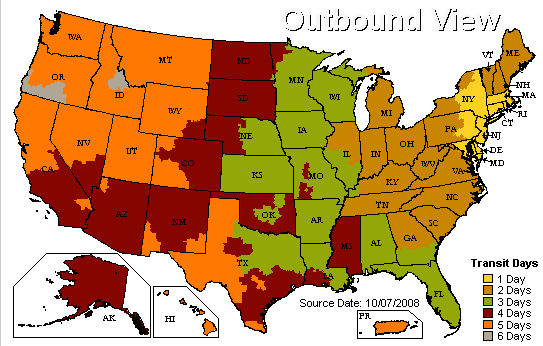 Ships Friday, April 26 if ordered in the next 2 days, 9 hours and 1 minutes! Our unique rustic collection Burlap and Lace garter. 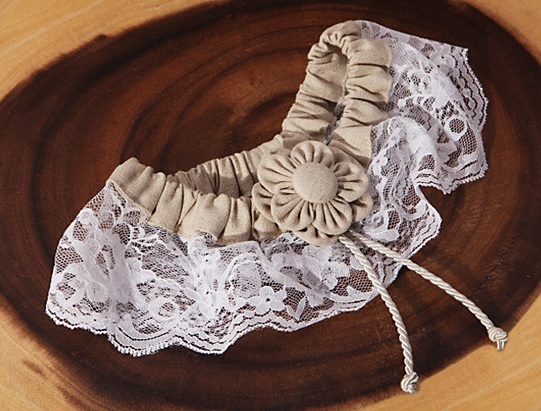 A stylish garter made of elegant lace and burlap material accented with a burlap flower. Each Garter comes packaged in a clear pvc gift box. A stylish accessory for your special day. 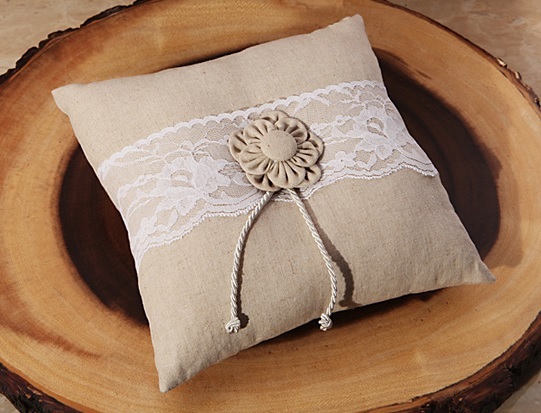 A burlap and lace ring pillow accented with a burlap flower . On your special day your wedding rings will be presented to you on this elegant ring pillow accessory. Each pillow measures approximately 7" x 7" and comes in a clear pvc gift box. The rustic flower girl basket is accented with burlap and elegant lace material and has a burlap flower in the center . 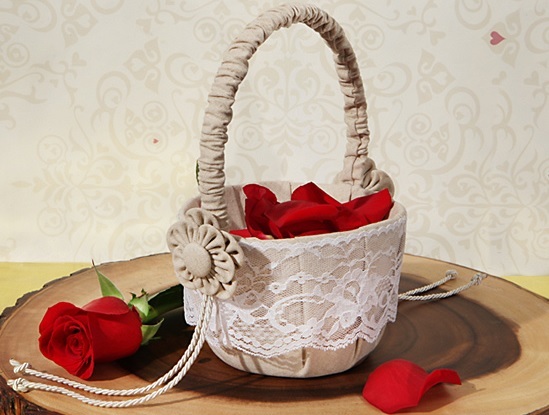 Your adorable flower girl will adore this stylish basket. Each basket comes individually in a poly bag and measures 7" x 4". 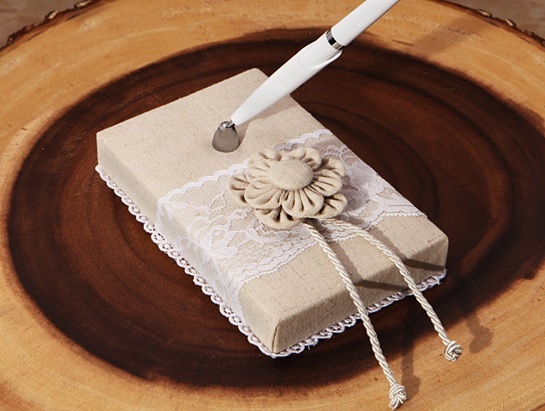 A stylish base pen holder decorated with burlap and elegant lace material accented with a burlap flower with pen included . Each set comes packed in an individual gift box .The base measures approximately 2" x 3 ''. 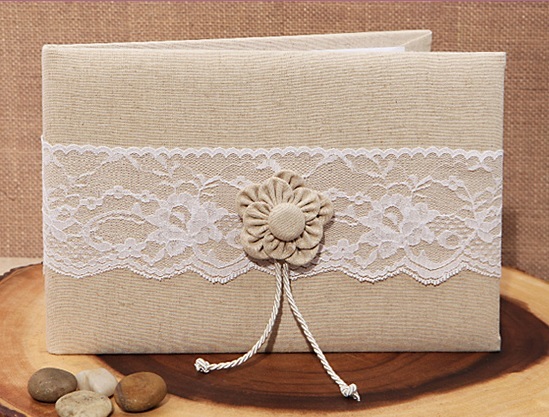 Our rustic collection burlap and lace Guest book is the perfect finishing touch to your special day. Our guest book has 50 lined pages that your guests can fill with their signatures to provide you with fond memories of their presence on your special day. Each guest book comes individually in a poly bag and measures 7" x 9". Our Rustic wedding accessory collection set will be a perfect addition to your special day. 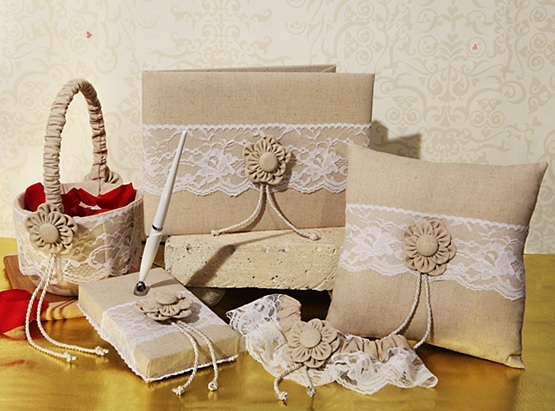 Each set come with a Rustic burlap and lace Guest book , pen and pen holder, flower girl basket, ring pillow and matching garter, all accented with a burlap flower and elegant lace.